As any gardener knows, the harvest is the best part of gardening. When it is time to reap what you’ve sown, a cute washable basket will do, but a harvest apron is even better. Plus, it doubles as a gardening apron to keep those knees clean when you’re working in the soil. I mentioned in the Unpaper Towel tutorial that I am not much of a seamstress. I rarely measure, I never iron, and I hardly pin. My method is this is what I want it to look like and if I do it this way, it might just work. 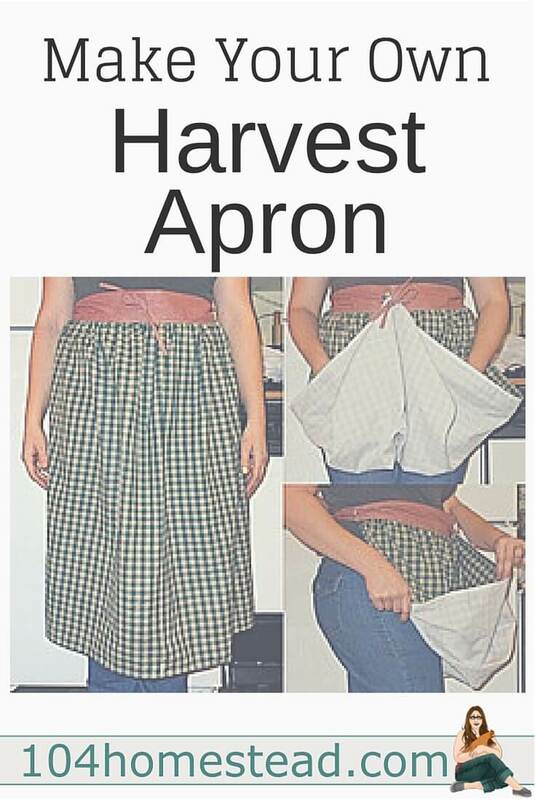 That being said, I’m going to tell you how I made my DIY harvest apron and tell you what I wish I had done differently. First, you need two pieces of material. As far as measurements, I made my first mistake here. 30″ wide was perfect for my size 8 frame, but 30″ long (instead of my 36″) would have made for a better length. For the width you want it to reach from hip bone to hip bone and have plenty of fabric to gather. You want one fabric to be “pretty” and one to be a heavier weight fabric like muslin or duck cloth. Cut both to your desired dimensions. 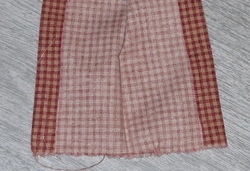 Sew sides and bottom using 1/2″ seam allowance, but leave the top open. 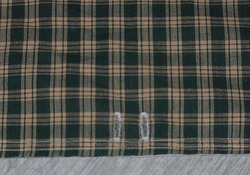 Once you have finished sewing the three sides, trim the corners, turn and top stitch. Again, you want to leave the top open. You can do your topstitching at any depth you prefer. I actually did two rows because I just felt it looked prettier that way. The next step I forgot to photograph, but I captured it in a picture for a later step. 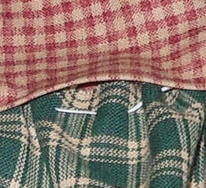 Basically, using the old-fashioned needle and thread, you want to do a wide running stitch along the top of your apron. Cut another piece of fabric that is 8″ wide and long enough to fit around your waist and have enough to tie. This will be your sash. With your iron (yes, I actually ironed), fold in the edges by 1/2″ and then fold in half and iron. If you are wise, you’ll take this opportunity to hem the raw edges, if not, you’ll join me in hand sewing at the end. Find the center of your sash and place it at your belly button. Mark where your hip bones are located, making sure that things stay even. I marked my areas with my kids’ chalk. Next find the approximate center of your apron. This is where things get tricky… You created an “envelope” when you did your sash. You want to put the center point of your apron inside the center of the sash. About 1″ in works well. Pin securely (yes, I used pins too). Next, pin the sides of the apron in the same way at the hip markings. From there, play around with the pleats/gathers and pin every 2-3″. Here you can see my running stitch pulled so it gathers. You can also see how it fits right into the pocket we created. Sew from the far end of the sash, across the apron making sure you catch all layers, and to the other far end of the sash. You can do another line of stitching to reinforce the seam if you wish. Now comes the button holes. I had never actually used that function on the sewing machine and had to google how it was done. If you need help, well… there were no good tutorials. Just hope your machine has A/C B and D labeled and use them in alphabetical order. You will need four buttonholes in all. One in each bottom corner and two in the middle. I used 1″ for all measurements here. The holes are 1″ long, the corner ones are 1″ from the side and bottom, the middle ones are 1″ apart and 1″ from the bottom. This is not an exact science, so don’t worry too much about things here. 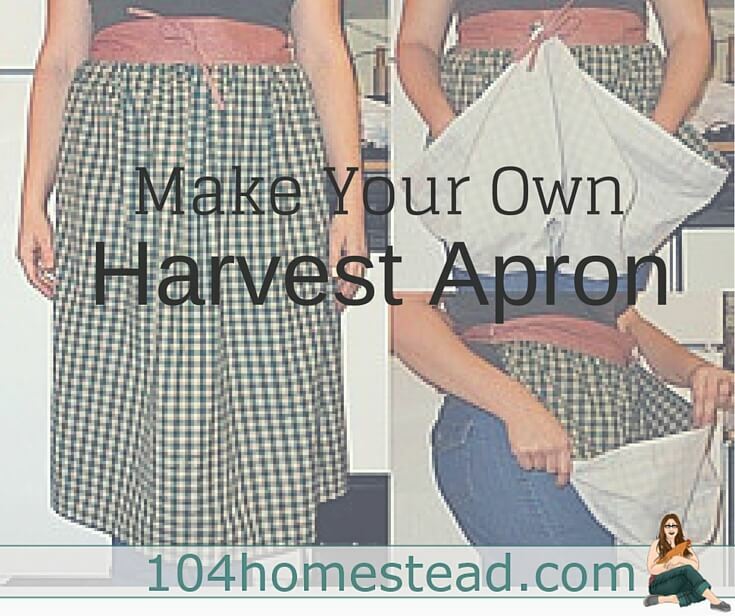 The point is to have a hole you can run your cord through to tie the apron up. 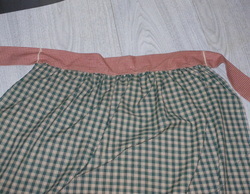 Securely fasten ribbon (either purchased or made from your fabric) in the middle of the waistband. You will use this ribbon to hold the weight of the stuff in your apron, so make sure it’s stitched securely. To use your apron, simply lift up the bottom and run the ends of the cord through the outside holes and then the inside holes. Tie tight and you are ready to harvest. Some additional thoughts: If you are handy you could add “egg pockets” or a bib. Make it work for you! If you need some help with your sewing skills (I know I do), check out Sew Confident: Essential Techniques for Beginners and online class from Craftsy. For more crafts and DIYs, subscribe to The Homestead Helper. I’ll share stuff like this as well as other “homestead where you live” ideas with you in our weekly newsletter. Just made two of these!! One for me and one for a friend. Thanks for sharing. The instructions where very easy to follow. It’s adorable apron. What is the length inches to be cut for pattern? 30″ or 36″ I’m confused. OH my…this is so cute!